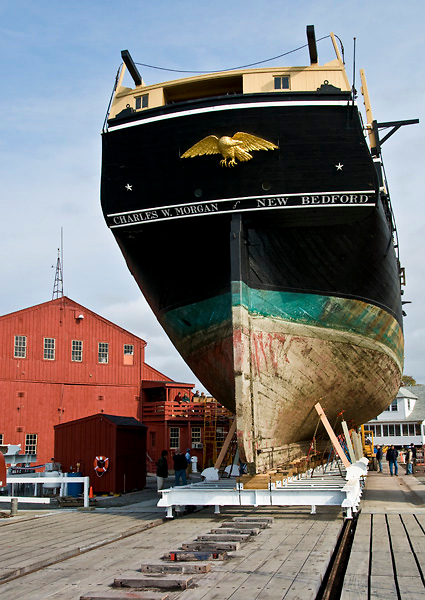 The Charles W. Morgan on the shiplift in the Museum’s Henry B. duPont Preservation Shipyard, Nov. 2008. The restoration of the Charles W. Morgan began on November 1, 2008 when she was hauled out of the water in the Henry B. duPont Preservation Shipyard at Mystic Seaport. The focus of this project was to address her structure below the waterline, much of which dates to her original construction in 1841. Records indicate her topsides have been rebuilt four times, the first instance in the 1880s and the last in the 1980s. Exposure to fresh water from rain encourages rot, whereas salt water acts as a preservative. Thus, the lower hull has not needed comprehensive attention until now. Once hauled, the first months were taken up with documentation, surveying, and adjusting the shape of the hull. Following that period, the interior or ceiling planks in the hold were removed to expose the frames to enable access for replacement and restoration. Each frame is made up of a series of five-foot-long sections called futtocks pegged and spiked together. Once work on the frames was complete, the ceiling planks were replaced, and then the exterior planking was addressed. In addition, the ship’s bow and transom required substantial rebuilding. The wood used on the Morgan was primarily live oak, white oak, longleaf pine, and black locust for fastening pegs (called trunnels). The restoration philosophy was to replace as little as possible. The guiding standard was whether the part in question could have a service life of 50 years. Those pieces needing replacement were carefully removed, thoroughly documented, and stored for future study. Mystic Seaport estimates 15-18 percent of the ship’s fabric now dates to 1841, including her keel, the floor timbers on the bottom of the hull, and some of the lower planking. She was built in just nine months in 1841. The latest restoration, which was completed in 2014, took more than five years.